One recurring trend in her wardrobe is the neck scarf. This is an item I had typically associated with flight attendants and classic films. Full disclosure: I also harbor a secret wish to take a drive in a convertible with driving gloves, chic sunglasses, a bold lip, and my hair tied neatly back in a scarf. That passing fancy aside, I hadn’t really considered them an option for daily wear. Until now. Especially for me, the accessory-phobe that I am, this is such an easy option to add dimension, color, and fun to just about any outfit. More to the point, it’s a really affordable way to play with style. You can, of course, spend hundreds on a truly fabulous Chanel scarf. BUT! 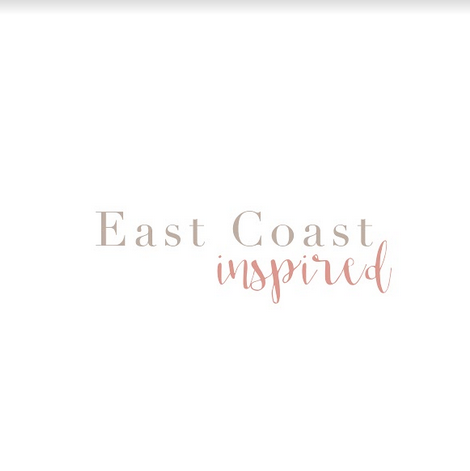 You can also spend as little as $6.99 at Madewell if you’re itching to give one a try. 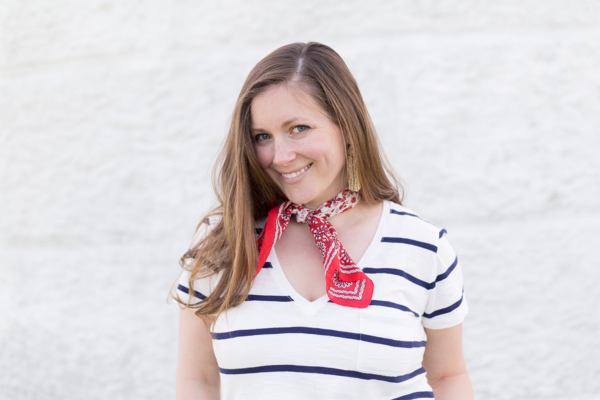 Amanda prefers to tie her scarves more tightly around her neck for a polished and classic look inspired by one of her favorite style icons, Audrey Hepburn. 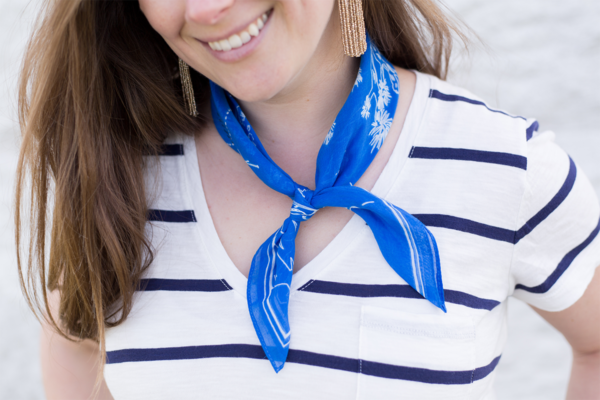 I’ve been playing around with how to wear these since I purchased two bandana scarves this summer. My personal style trends towards fussy, so I have opted for a looser scarf tie to rein it in. 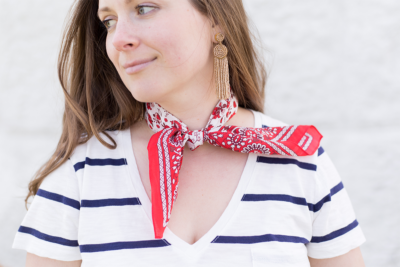 Scroll below for an easy breezy tutorial on how to tie it both ways and enjoy adding carefree pops of color and panache all summer long! 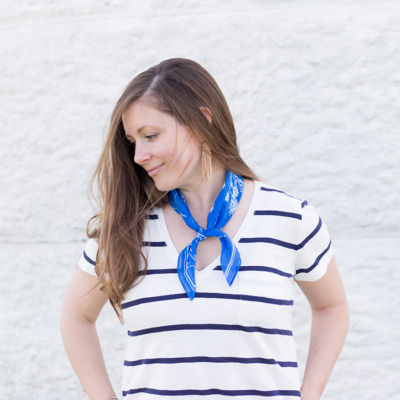 Fold the scarf into a triangle (it will give you additional length) and fold or roll the point inward until the scarf is about 1-2 inches thick. 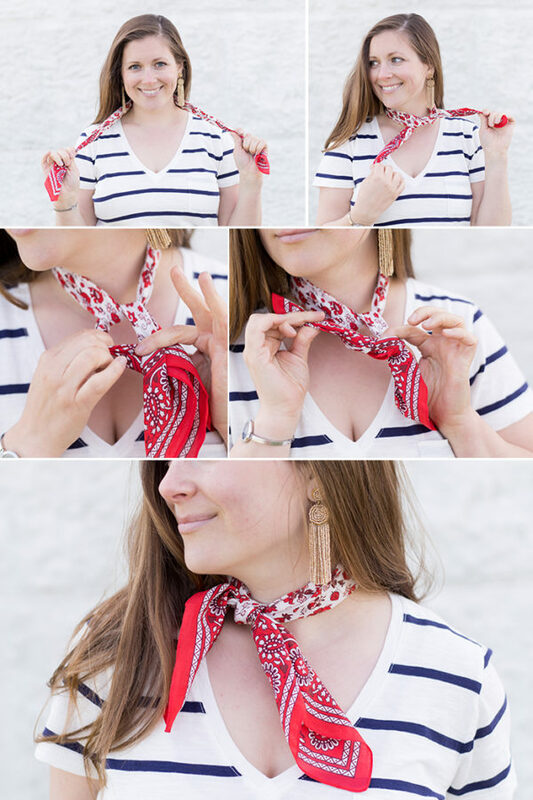 Wrap the scarf around your neck, crossing one end over the other in the front and pulling the end from the underneath over and through to begin the knot. Pull it slightly snug against your neck. 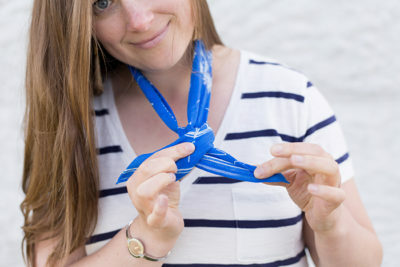 Hold the upper section of the first knot out straight and wrap it over and through the lower section. Pull the knot tight and adjust as necessary (from the inside or the outside of the knot) to a comfortable degree of snug-ness. This style can look so different by simply placing the knot to the side or back rather than the front, and with a snug fit it will stay in place nicely. For the looser style I prefer, simply keep the initial tie farther from your neck before completing the knot. Adjust the ends as needed to lay neatly.